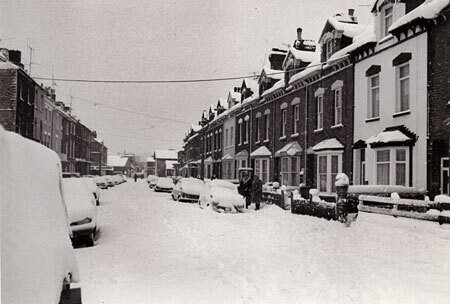 Late February 1978 saw the biggest blizzard sweep the South West since the 1890's. Many villages were cut off for several days and Telegraph Hill was choked with traffic as it was impassable. Only a single, winding lane was driveable on the M5. Exeter was badly hit, but not too such an extent as the country areas. 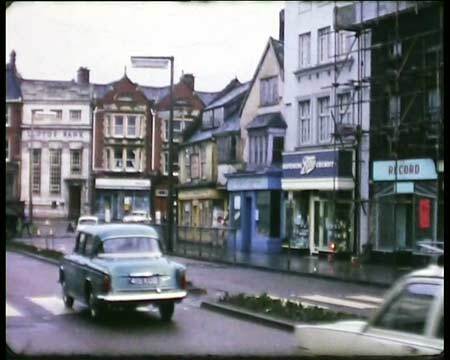 11 MB WMV film by Peter Werran - filmed in 1970 when Cowick and Alphington Street were demolished for the Exe Bridge roundabout and the St Thomas Centre. Shows the small courtyards off Cowick Street and Pikes Garage. 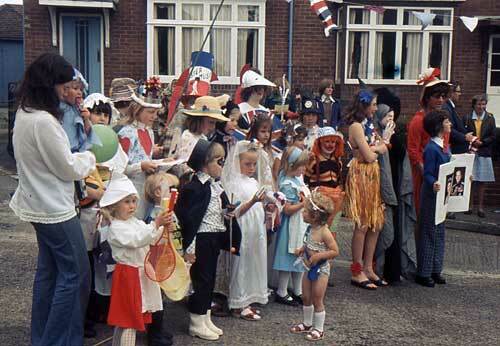 Children in fancy dress line up in Beacon Lane for the Queen's Silver Jubilee Celebration. Although not the warmest summer, the occasion was the last in which street parties were arranged. Nowadays, we just watch the proceedings from London on the TV. Photo courtesy of Lydia Barnard. 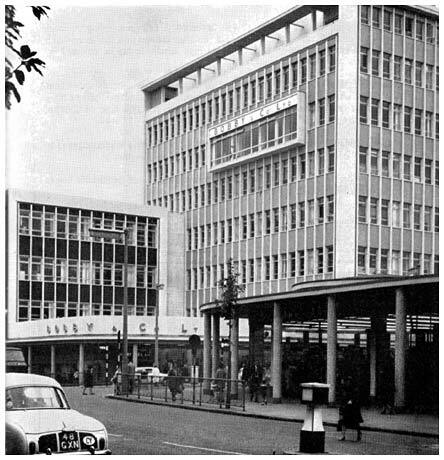 The Royal Devon and Exeter Hospital at Dean Clarke House, moved to a new tower block in Barrack Road, Wonford during 1974. 5 MB WMV film. I filmed this heavy horse show on 8mm equipment in August 1974, and then forgot about it, until recently. Some in Exeter, will have memories of the show, which is why I have put it on the site. Included are shire horses cutting a field of corn and a working threshing machine, giving a record of how Devon once was. 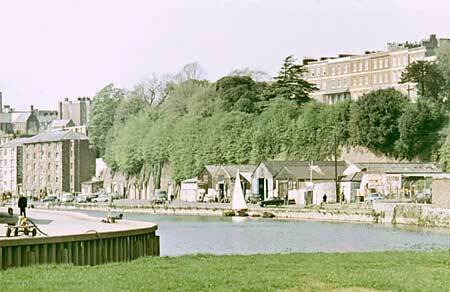 In 1971, Roland Lake, owner of the old Exeter chemist, Hinton Lake, retired, and the business was sold to Holman Ham. 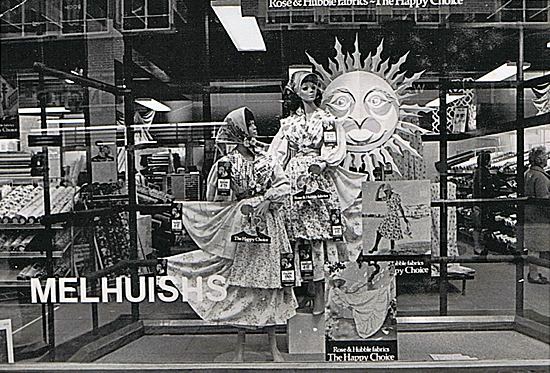 The shop became Star Jeans for a time, before it was occupied by Laura Ashley. Genette Tate disappeared in August 1978. The incident room was moved to Heavitree Police Station. Extensive searches were made around Aylesbeare, and the suburbs to the east of Exeter. 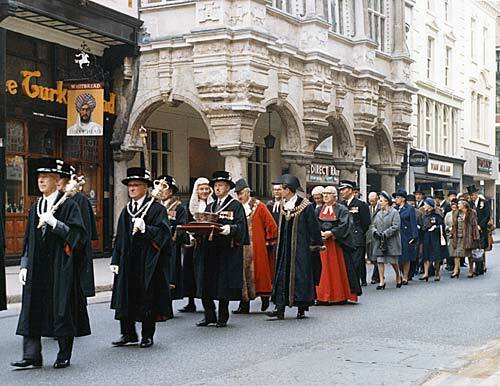 In 1971, three years before Exeter lost its county status and became a city council, the last assize was held. The top procession shows the last procession from the Guildhall to the Cathedral. In the photo can be seen Judge M G Polson Recorder of the City, Mayor S Sargeant, and Sheriff Michael McGahey. 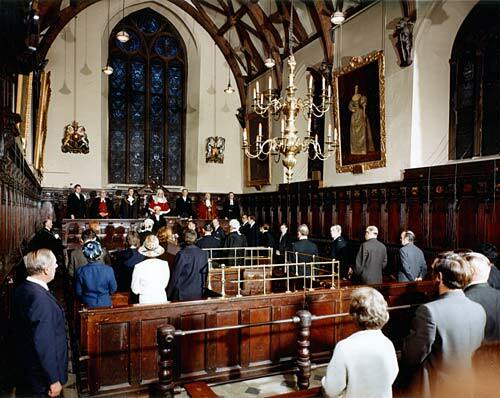 The lower photograph shows the last assize session in the Guildhall - there were no cases to be heard, so the Mayor closed the session and called for this photograph to be taken. On 3rd June 1977, Exeter schools attended a Jubilee Thanksgiving Service. Later, all the children were presented with a Jubilee mug. St Luke's College of Education was incorporated into Exeter University. The Priory High School became a mixed comprehensive school for 12 to 16 year olds in 1973. In 1973 Ladysmith Secondary Modern Boys' School closed and was amalgamated with the Girls' Secondary Modern School at Beacon Heath to become St James' High School, a 12 to 16 mixed comprehensive school. In January 1971 there was a postal strike that lasted 44 days. The postal workers had turned down an 8% rise, demanding 15% to 20%. They settled for a complex package that came no where near their demands. Private organisations could issue stamps and deliver mail. 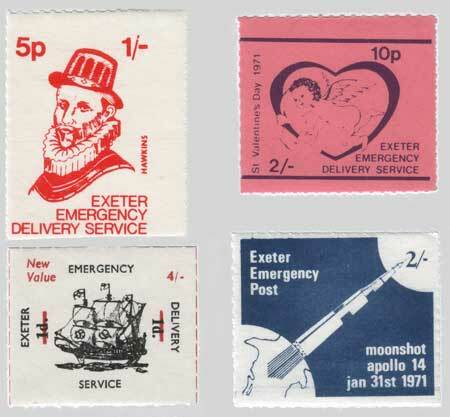 These stamps are printed Exeter Emergency Delivery Service. 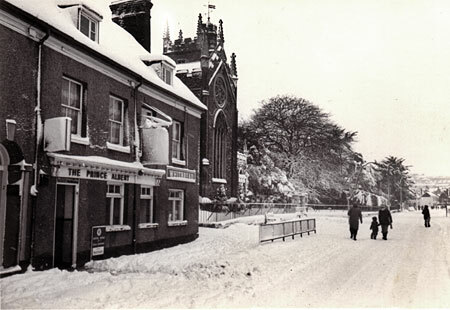 Exeter schools closed for a holiday on 14th November 1973 for the wedding of Princess Anne and Captain Mark Philips. On 9th November 1979 Queen Elizabeth and Prince Philip visited Exeter. The former house of the Baring family, Larkbeare House was declared unsafe in 1975. 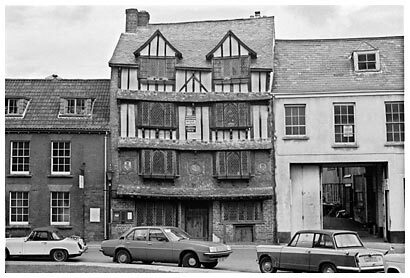 In 1977 it became a listed building and was restored by the Devon Historic Buildings Trust. Renslade House, probably the ugliest building in Exeter was built in 1971. 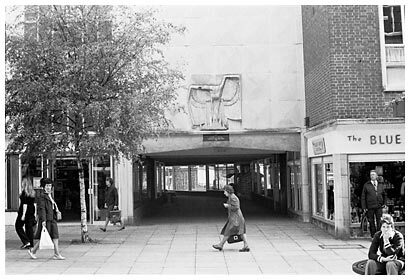 On the 30th September, 1977 the Silver Jubilee Jubilee, 'Looking Forward' Bronze in the Guildhall Centre was unveiled by the Mayor. Designed in 1969, the first Exeter Hip was inserted into a patient in 1970. It was developed by Professor Robert Ling, working at the Princess Elizabeth Othopaedic Hospital. Between 1970 and 1975, only three needed a replacement out of 32, through wear and tear. One patient has had a hip for 33 years without a problem. It is now the most widely used hip in the world. 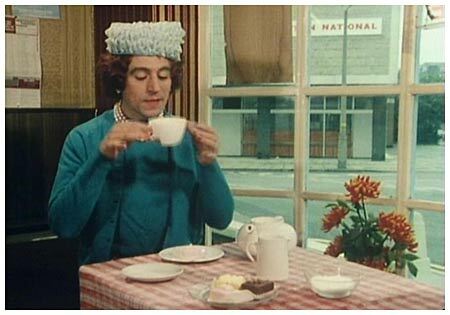 In September 1974, the Monty Python Flying Circus team visited Exeter to film their last series. This shot was inside the Clock Tower Cafe. They also filmed at Eastgate, Thornton Hill, Cowick Street, Lower Argyle Road and Maryfield Road. 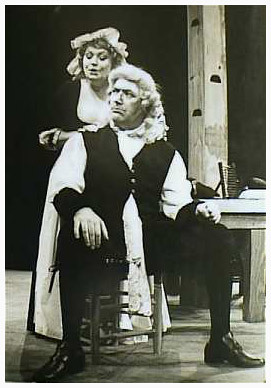 By the 1970s the Northcott Theatre was attracting some well known names, and producing many classic productions. 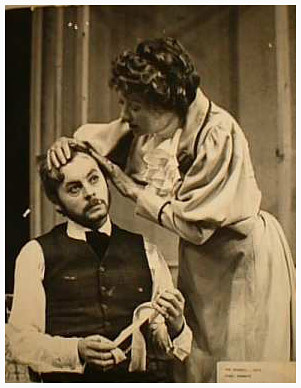 This is Hywell Bennet in Chekov's, The Seagull, 1974. 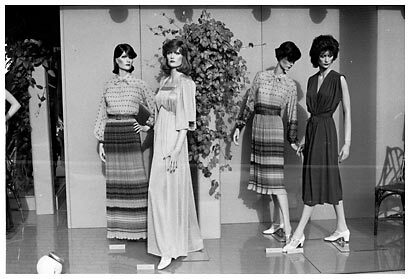 In the 1970's, Roberts Bros. Circus would visit the Exeter Showground, at Whipton. 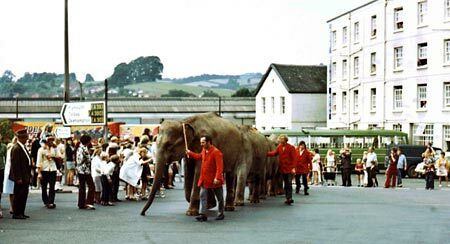 To promote the show, they would unload the elephants from trucks at St David's Station and march them up St David's Hill, and through the town. 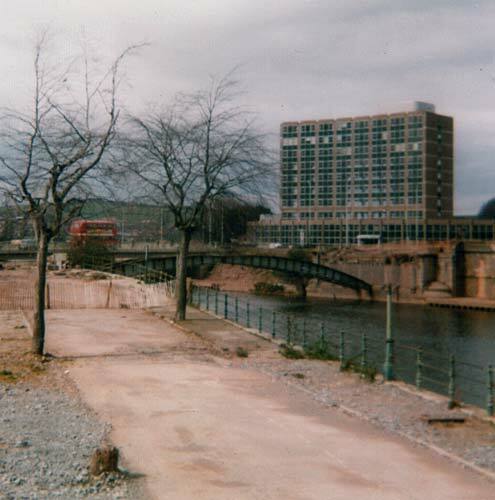 This photo shows them by the Great Western Hotel, starting on their journey, circa 1975. Photo courtesy of Alan Mazonowicz. 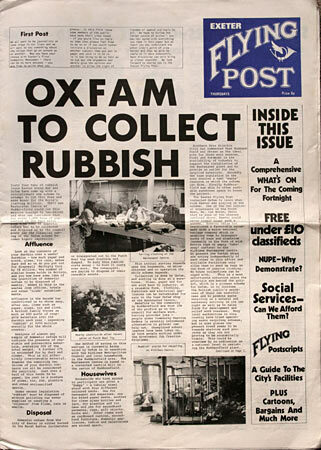 On the 19th February 1976, the new Exeter Flying Post hit the newstands. More irreverant and outspoken than the old Trewman's Exeter Flying Post that closed in 1917, the new weekly publication was published from the 3rd floor of 195, High Street, although the entrance was in Parliament Street. 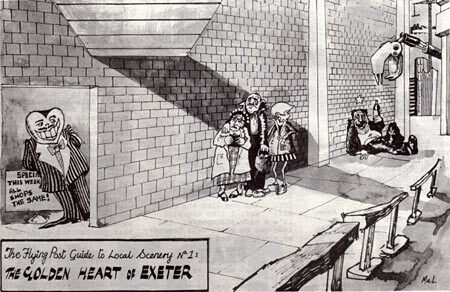 They aimed to cover 'events, people and facilities' and 'that the citizens of Exeter shall write it'. They were still running in 2008 as a bi-monthly, in a more magazine format. This cartoon appeared in the first issue of the Flying Post. It alludes to the sterile streets created by the Golden Heart redevelopment of the Guildhall Centre. It shows drunks, frightened shoppers and con-men lurking in the shadows of the redevelopment. 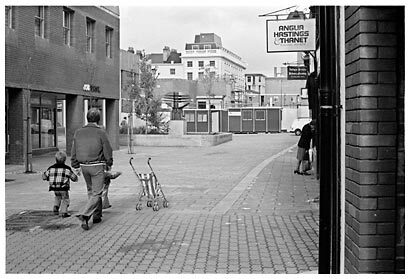 The scale and design of the Guildhall Centre was not universally popular, and even now, many dislike the drab canyon of Paul Street and the ugly east side of North Street. 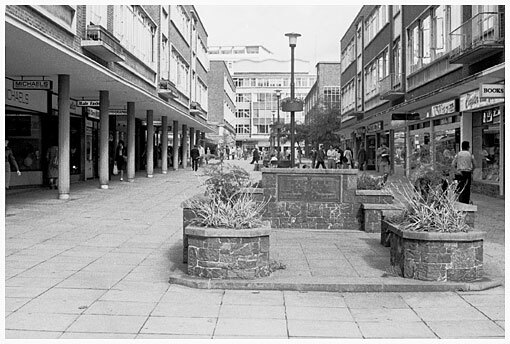 Many also thought that all the shops were the same, similar to comments about the new Princesshay development and the clone High Street. 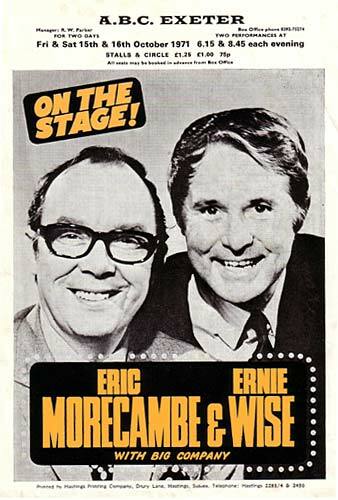 The Barnfield Theatre was opened by the Mayor of Exeter on 24th February 1972, after it was restored at a cost of £50,000 by the Exeter Little Theatre Company. 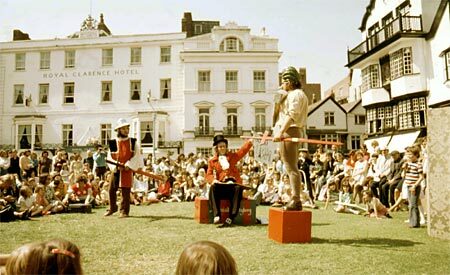 There are strange happenings in Cathedral Close during 1975, when the crowd are entertained in the Exeter Festival. 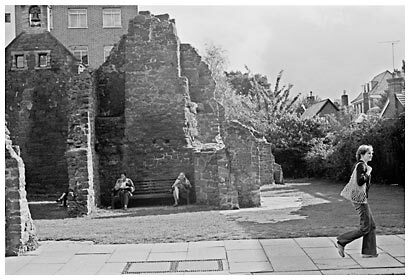 The Cathedral Close is often used for festivals and many a silly thing has occurred on the grass. Maybe you are in the audience. Photo courtesy of Alan Mazonowicz. 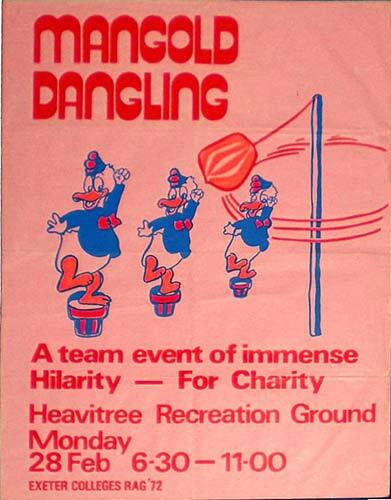 On 28th February 1972, Exeter College Rag staged a Mangold Dangling event at the Heavitree Recreation Ground. University and college rag weeks do not seem to have the same prominence in the 21st Century. We can look back and wonder exactly what Mangold Dangling was, and if any mangolds were scared or hurt in the event! Scan courtesy of Peter Rice. 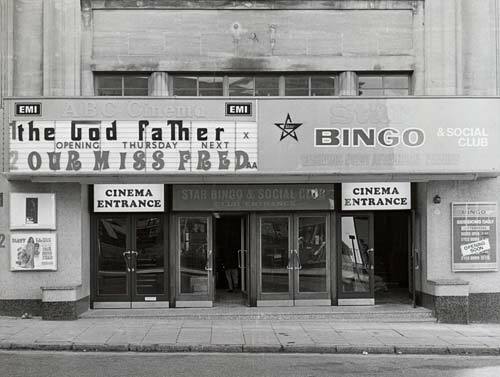 The film of the year in 1972 was the God Father starring Marlon Brando – the Express and Echo thought it important enough to photograph the front of the ABC when it was being shown. The other film playing was the British Our Miss Fred with Danny La Rue, a comedy using his drag queen talents to the full. Photo Express and Echo. 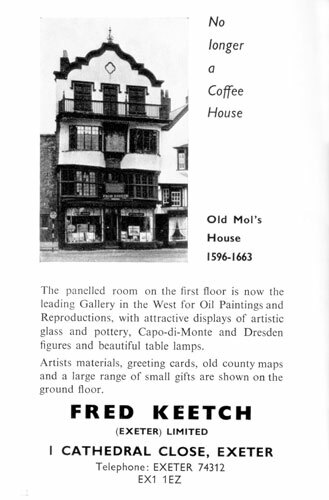 Since the turn of the century, Worths Gallery had occupied Mol's Coffee House in Cathedral Yard. By the 1970's it had become Fred Keetchs' Gallery. This is one of the most photographed buildings in Exeter. Do you remember Exeter's Annual Air Day? 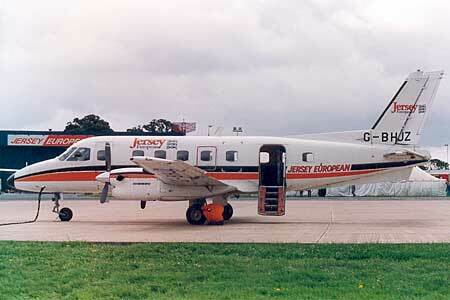 The small Bandeirante was there in 1977, part of the Jersey European fleet, now FlyBe, the largest regional airline in Europe. 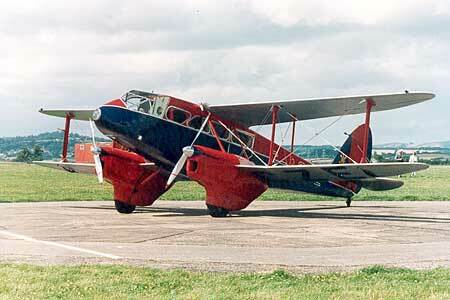 Also at the 1977 event, a Rapide, (top) the first aircraft type to land at Exeter Airport when it opened in 1937. Photos courtesy of Alan Mazonowicz. 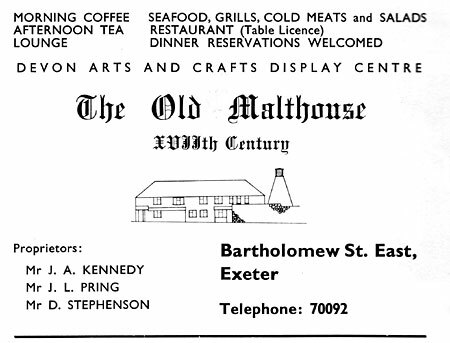 This old malthouse was a gallery before it became Ginos Restaurant. Photo courtesy of Alan Mazonowicz. 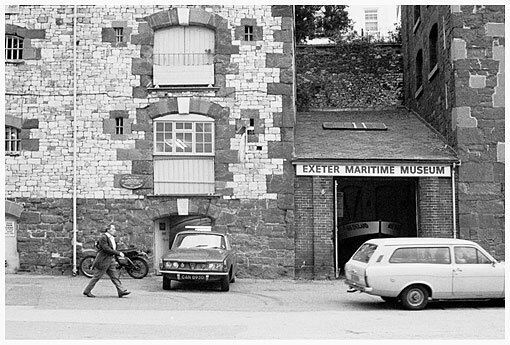 The entrance to the Maritime Museum between the 1834-5 warehouses in October 1979. This gap is now a glass atria and lift. The museum was a major tourist attraction. 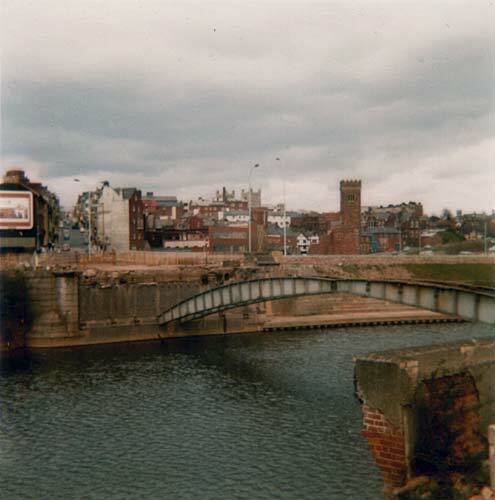 Photo October 1979 by David Cornforth. The House that Moved on the right - October 1979. 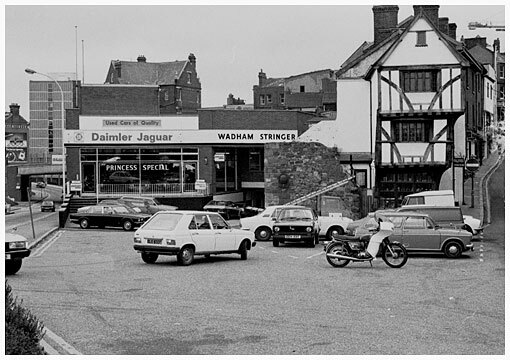 Wadham-Stringer the Daimler Jaguar agents occupied the building behind - Comet, and Radmore and Tucker have also traded from these premises. 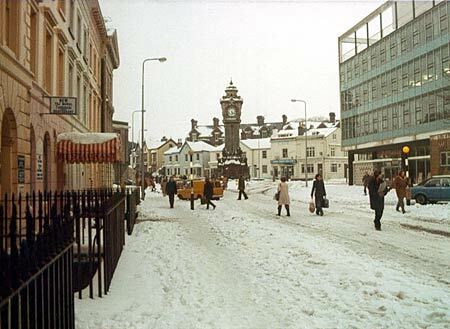 Photo October 1979 by David Cornforth. 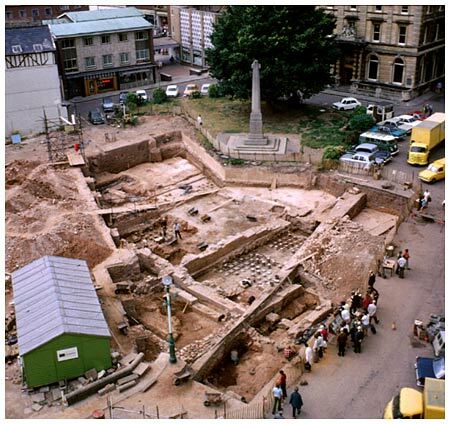 The Roman Bath House, was uncovered by archaeologists when St Mary Major Church was demolished in Cathedral Yard in 1971. The photo shows the extent of the investigation with the hypercaust tiles clearly visible. Also see Bath House photo essay. Photo courtesy of the RAMM, Exeter. In 1974, Devon County Council took over sole ownership of Exeter Airport from the former local consortium. The Tudor House, Exe Island - this building was restored in 1964. 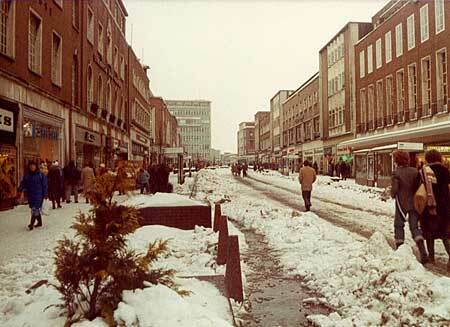 It has little changed since 1979, apart from some bollards in the front, along the pavement. 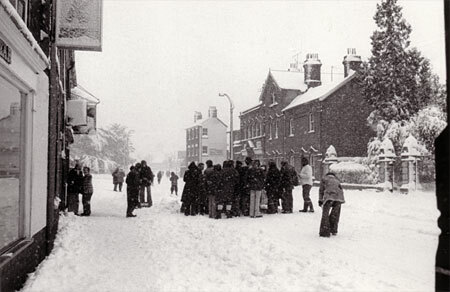 Photo October 1979 by David Cornforth. 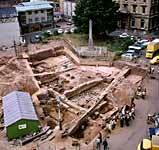 The remains of this ancient building can be found in Catherine Street. The ruins have been restored (2005) to allow access from the rear and to add an artwork that interprets the site with archaeological finds. Photo October 1979 by David Cornforth. These two shops are well known in the High Street as Laura Ashley(Star Jeans) and Thorntons Chocolates (Watches of Switzerland). Star Jeans was formerly Hinton Lake Chemists. 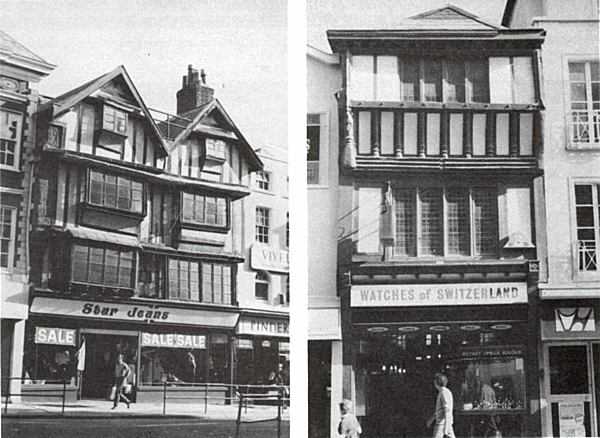 The Watches of Switzerland shop has a Tudor façade, believed to be the oldest carved shop front in Devon. 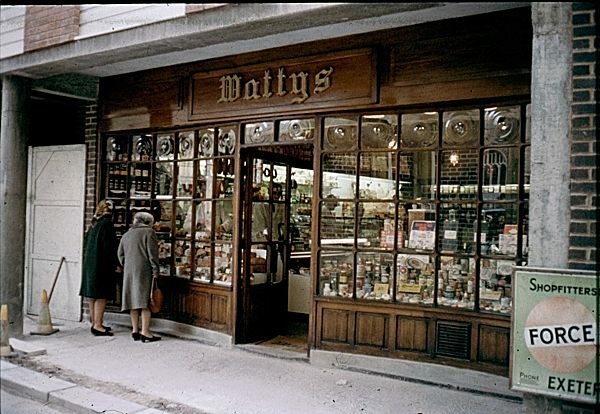 A forgotten business, located at 36 Princesshay in 1977, Melhuish's were established in 1904. Photo courtesy of Peter Rice. 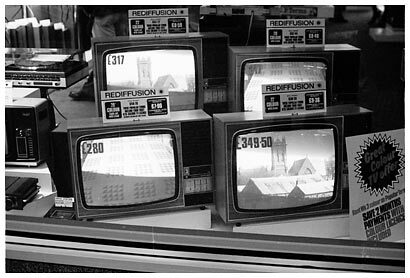 We no longer have TV rental shops in the High Street - Rediffusion has a display of 'modern' TV sets in 1979. Photo David Cornforth. 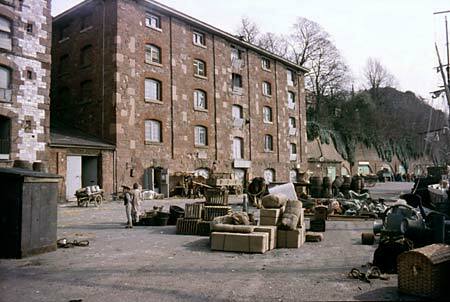 The engineering company Vapormatic moved from Budleigh Salterton to Sowton, and opened a new warehouse and development facility in 1977.